Based at The Home Farm Shop, The Happy Hog Roast was founded on the recommendation of one of their customers who had been to a Hog Roast and said the pork ‘wasn’t a patch on theirs’ so Alison set up as The Happy Hog Roast and has been going from strength to strength, ever since. We are proud of the quality of our produce, and are happy to provide a service for your event that you too can feel confident in and with the knowledge that your guests are getting a truly mouth watering experience! Part of the secret to our success is that we really do enjoy doing them.You can rest assured that you won't have to give the catering a second thought, leaving you free to enjoy the day. 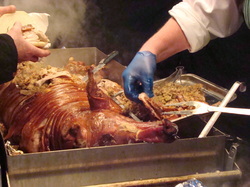 We are happy to discuss your individual requirements and budgets, (ask about Lamb Roasts, Beef roasts or B-B-Qs), The Hog Roast is a real Focal Point giving any Function that all important Wow factor.